A low growing plant. This small shrub has arching dark brown stems with green leaves and pink flowers followed by red berries throughout the year. 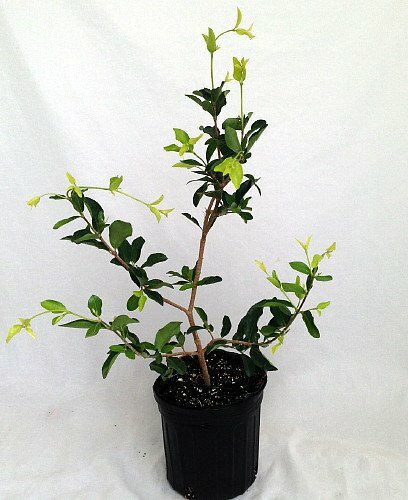 Excellent bonsai or house plant specimen. The creeping stems and sometimes exposed roots can create really interesting shapes. 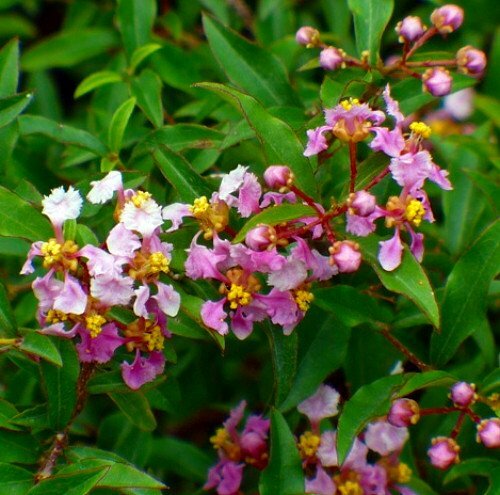 The Dwarf Cherry is a small tree or shrub that grows up to 15 feet in height in the dry deciduous forest and can be found growing wild and under cultivation on the sandy soils throughout Northeast Brazil. It is native to the West Indies and is also found in northern South America, Central America and Jamaica. 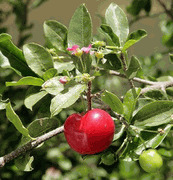 Acerola is the fruit of the tree. It is bright red and 1 to 2 cm in diameter with several small seeds and has an appearance similar to the European Cherry. Acerola is also known as "Antilles Cherry" or "Barbados Cherry." The mature fruits are juicy and soft with a pleasant tart flavor and they contains about 80% juice and a large amount of vitamin C as well as iron, calcium and phosphorous.